Today was hot hot hot, and I don’t mean that in a “Hey, that’s a great 80’s song!” kind of way. According to Weather Underground, it was 91.5 degrees. And it felt like 91.5 degrees. Or maybe more. Oh, and here’s another valuable tip from Shelby–when you bring along your sunscreen to apply when you get there, make sure there’s actually enough in the bottle to do the job. I had to buy a bottle of Coppertone from the little newsstand hut thing in Downtown Disney next to the Wetzels cart, and much to my surprised, they charged exactly what I would have paid at Walgreens. I thought for sure I was going to get stuck with $35 sunscreen, but nope! So that was a bonus at least. Oprah's so lucky to have an acronym-conducive name. If I had my own network, it would be SLRH, and that's just...no. 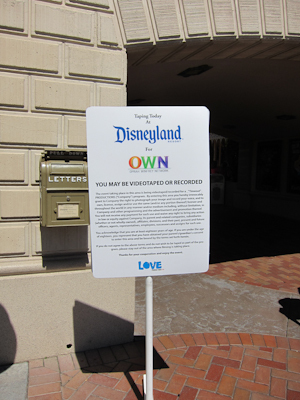 In case you can’t read miniature print, it says that OWN, the Oprah Winfrey Network, is filming in the park today, blah blah blah, if you don’t want to be on TV then avoid the cameras. So of course I immediately went to look for the cameras. But then I felt like I should ride a ride, so I hopped on Buzz Lightyear (post coming soon), and then Theo became very unhappy when I swung through Fantasyland (he wanted to ride the carrousel and kept saying “horse? horse? horse?” in an extremely pathos-inducing tone of voice) so I figured I would 1) abandon my search, 2) find a nice, shady spot to rest for a second, and 3) refill my water bottle. Did I mention it was hot? Good lord, it’s not even April yet. Even though it will be tomorrow. 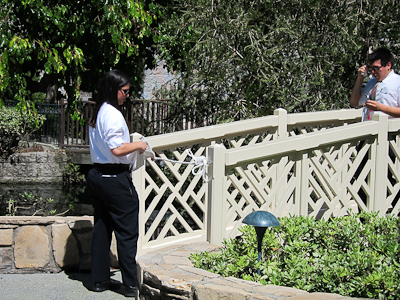 Off to my right was a small bridge that leads to the Carnation Plaza Gardens, a little stage tucked away near Frontierland that I absolutely love. 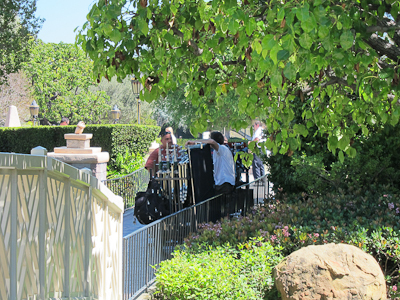 I noticed a bunch of official-looking cast members with clipboards, and lots and lots of equipment on carts. I walked over the bridge and so as not to be conspicuous, having learned my lesson from the Awkward Social Situation, walked to the stage area and turned around to snap a picture. I know that doesn’t look impressive, but there was more there that didn’t make it into the shot. However, I stopped caring about Oprah when I saw a high school choir performing on the stage. They were just wonderful, and Theo was entranced. And I will blog about them later. Suffice to say, they never set anything up and I never really got close to being on Oprah. But I think her camera crew is a good second best.